ACQUISITION/REHABILITATION: THE 10% ANTI-CHURNING RULE Gary A. Band, Esquire Nixon Peabody LLP 401 9th Street, N.W. Washington, D.C. 20004 (202) 585-8809. 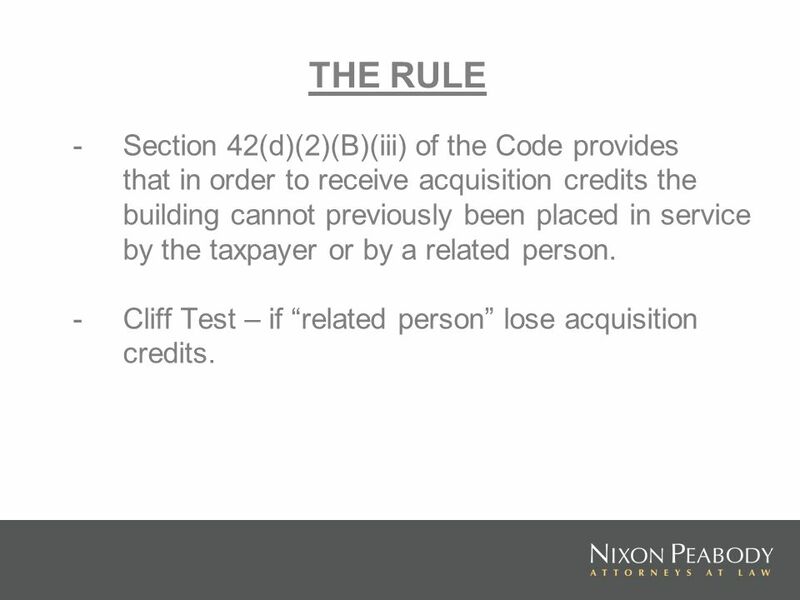 3 THE RULE -Section 42(d)(2)(B)(iii) of the Code provides that in order to receive acquisition credits the building cannot previously been placed in service by the taxpayer or by a related person. 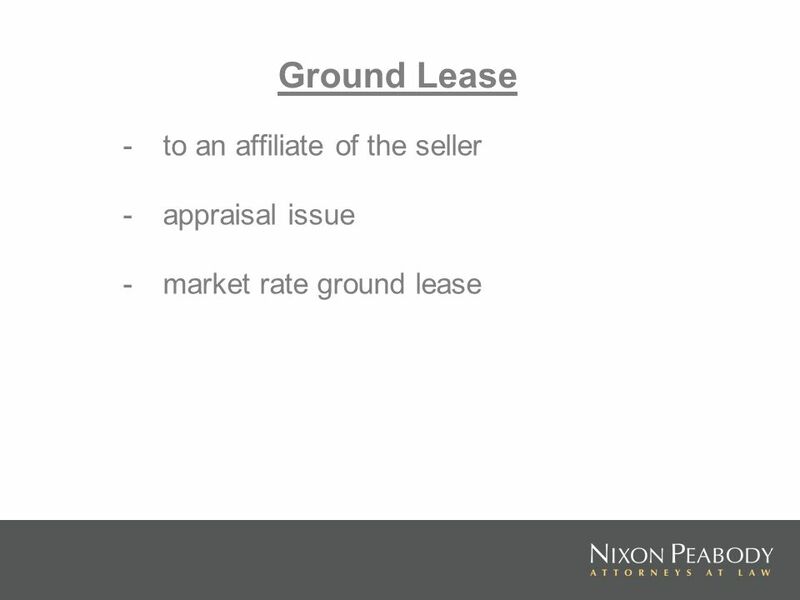 -Cliff Test – if related person lose acquisition credits. 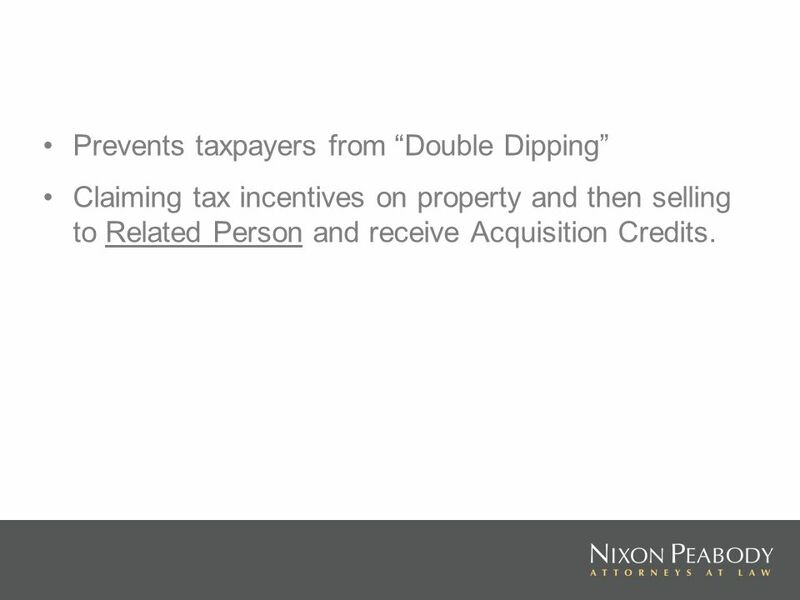 4 Prevents taxpayers from Double Dipping Claiming tax incentives on property and then selling to Related Person and receive Acquisition Credits. 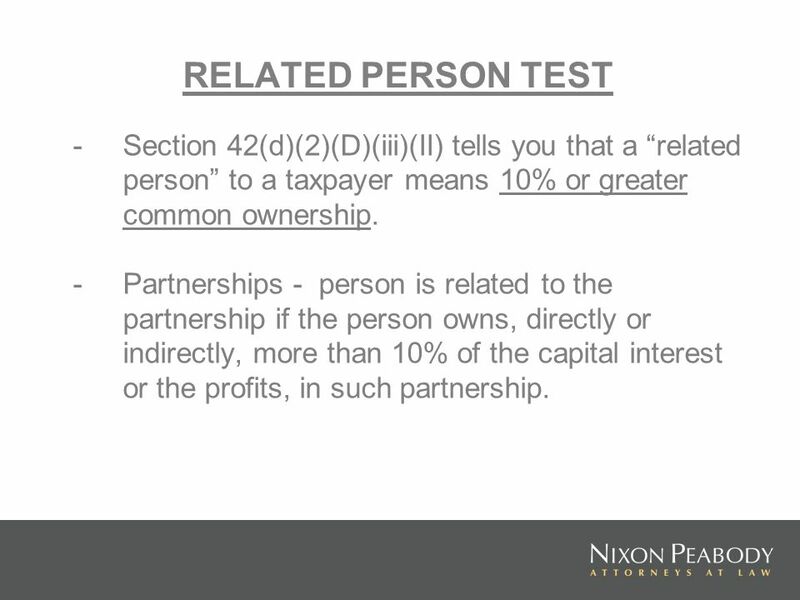 5 RELATED PERSON TEST -Section 42(d)(2)(D)(iii)(II) tells you that a related person to a taxpayer means 10% or greater common ownership. 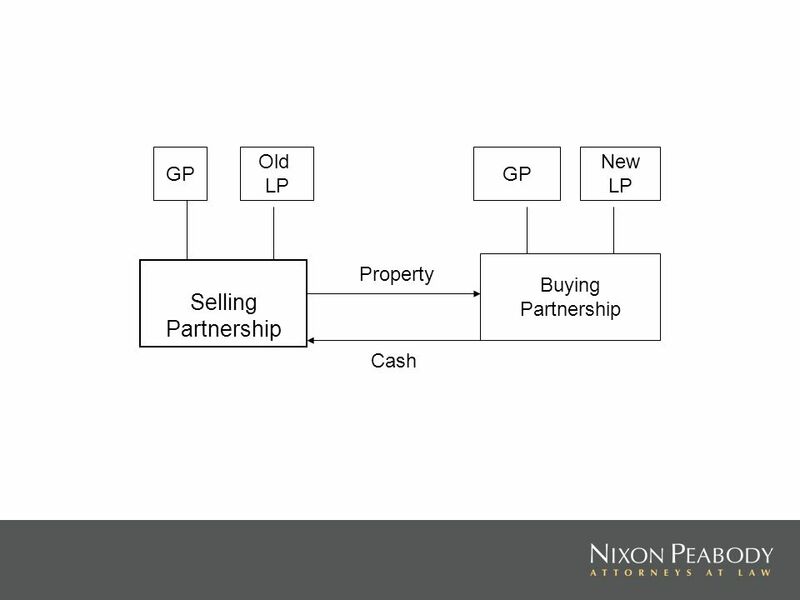 -Partnerships - person is related to the partnership if the person owns, directly or indirectly, more than 10% of the capital interest or the profits, in such partnership. 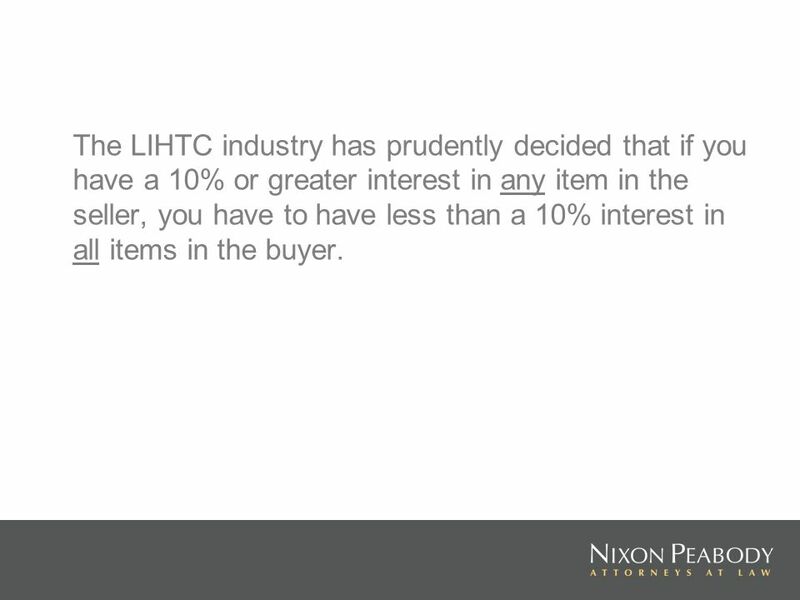 7 The LIHTC industry has prudently decided that if you have a 10% or greater interest in any item in the seller, you have to have less than a 10% interest in all items in the buyer. 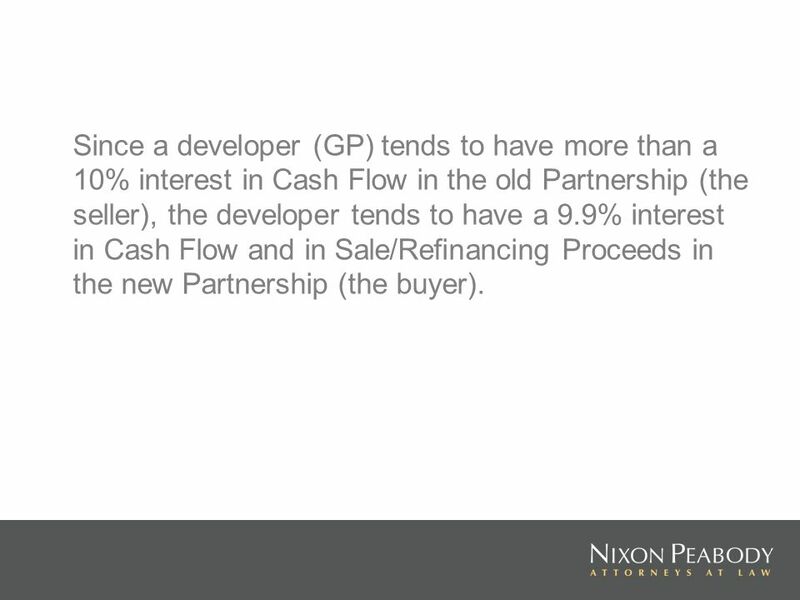 8 Since a developer (GP) tends to have more than a 10% interest in Cash Flow in the old Partnership (the seller), the developer tends to have a 9.9% interest in Cash Flow and in Sale/Refinancing Proceeds in the new Partnership (the buyer). 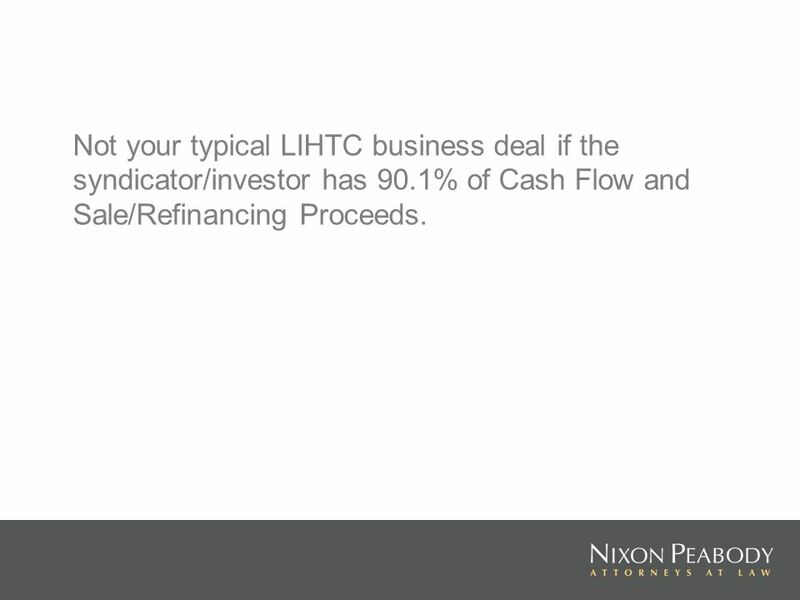 9 Not your typical LIHTC business deal if the syndicator/investor has 90.1% of Cash Flow and Sale/Refinancing Proceeds. 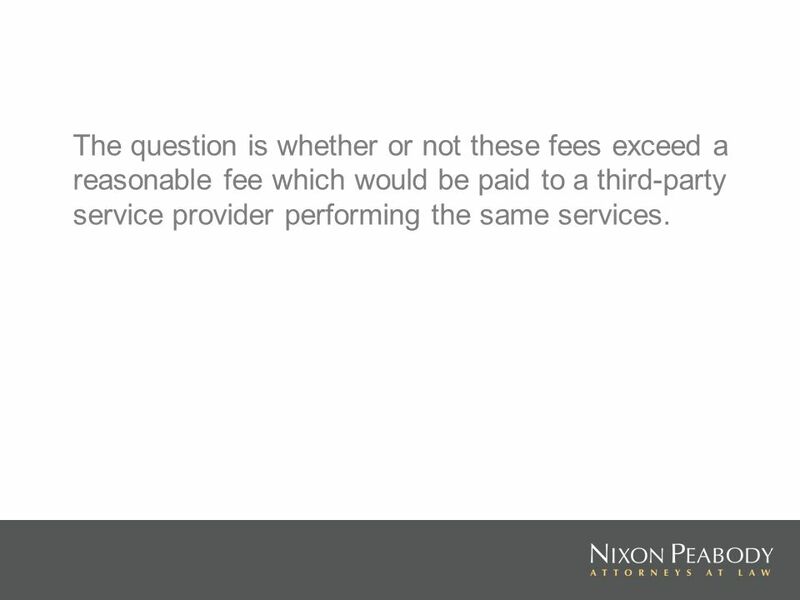 11 The question is whether or not these fees exceed a reasonable fee which would be paid to a third-party service provider performing the same services. 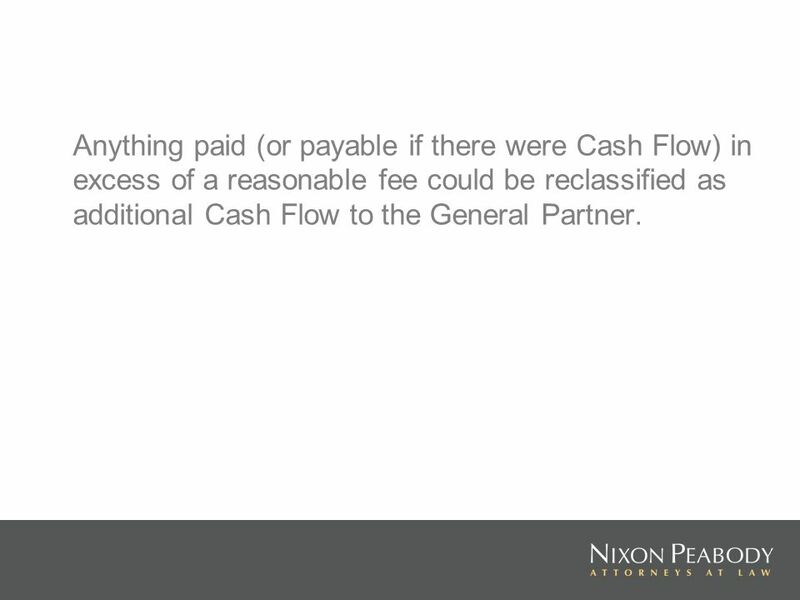 12 Anything paid (or payable if there were Cash Flow) in excess of a reasonable fee could be reclassified as additional Cash Flow to the General Partner. 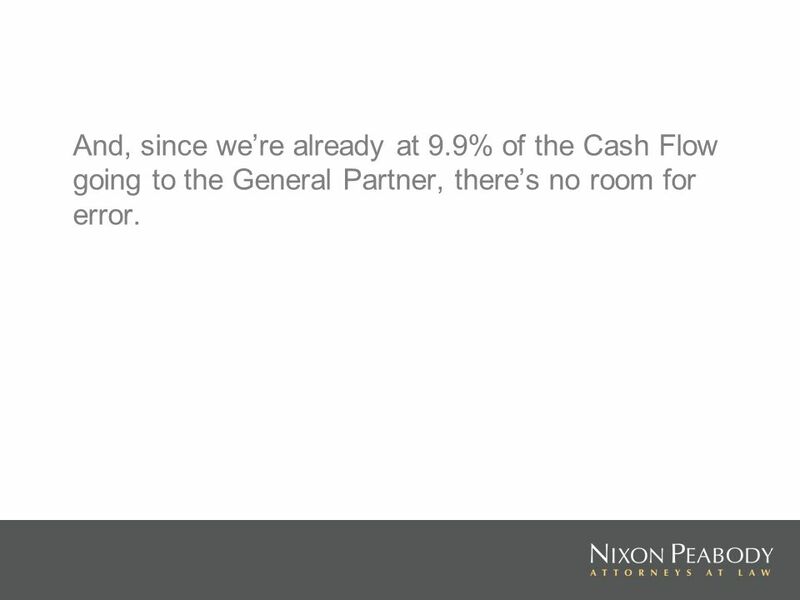 13 And, since were already at 9.9% of the Cash Flow going to the General Partner, theres no room for error. 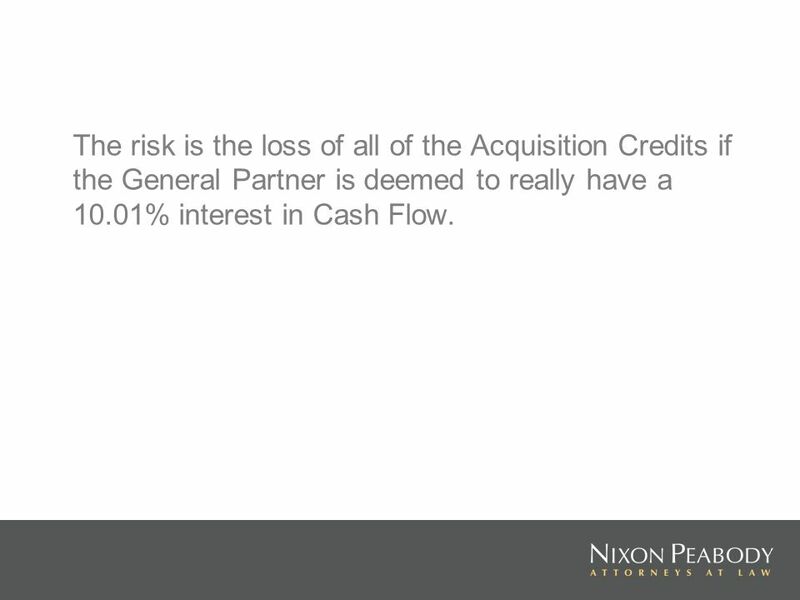 14 The risk is the loss of all of the Acquisition Credits if the General Partner is deemed to really have a 10.01% interest in Cash Flow. 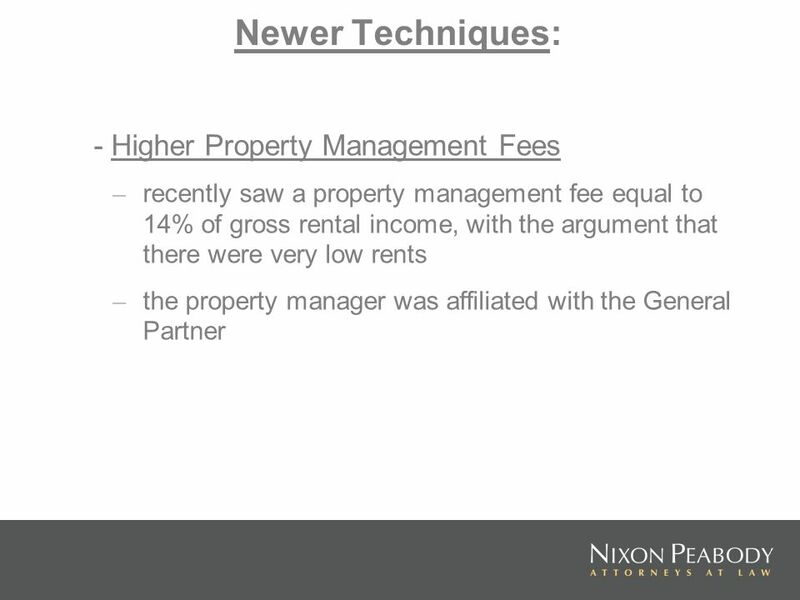 15 Look at these Cash Flow fees to see if theyre reasonable. 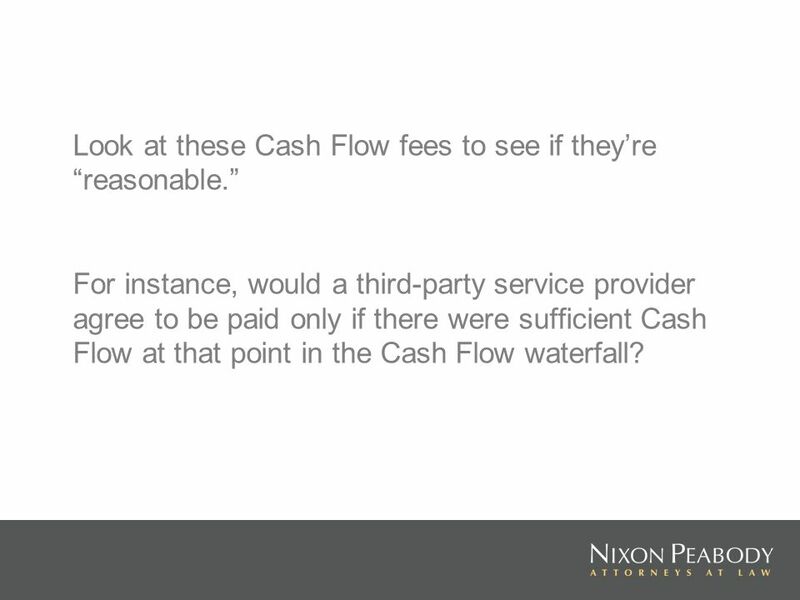 For instance, would a third-party service provider agree to be paid only if there were sufficient Cash Flow at that point in the Cash Flow waterfall? 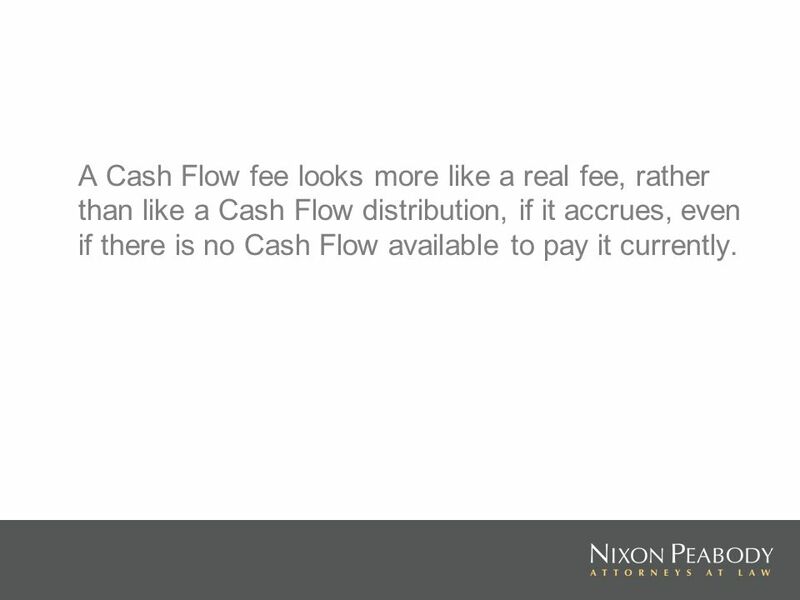 16 A Cash Flow fee looks more like a real fee, rather than like a Cash Flow distribution, if it accrues, even if there is no Cash Flow available to pay it currently. 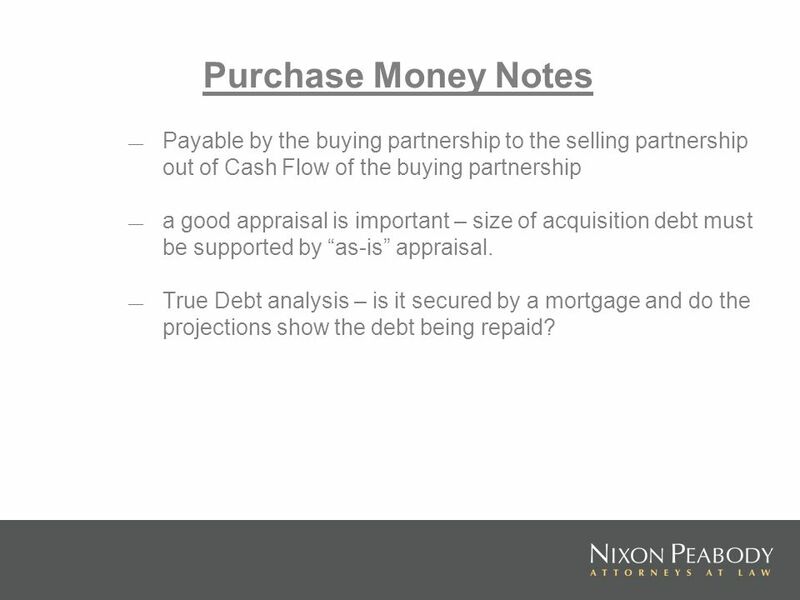 18 Purchase Money Notes Payable by the buying partnership to the selling partnership out of Cash Flow of the buying partnership a good appraisal is important – size of acquisition debt must be supported by as-is appraisal. True Debt analysis – is it secured by a mortgage and do the projections show the debt being repaid? 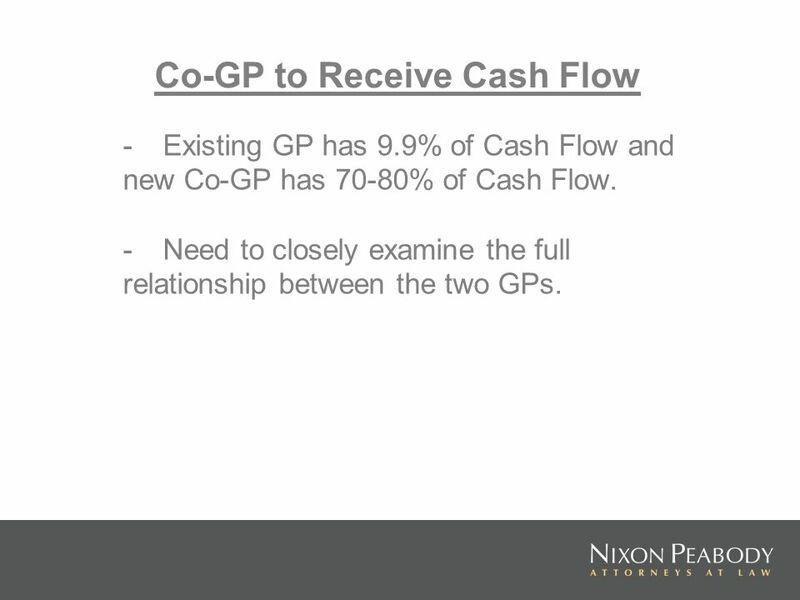 19 Co-GP to Receive Cash Flow - Existing GP has 9.9% of Cash Flow and new Co-GP has 70-80% of Cash Flow. - Need to closely examine the full relationship between the two GPs. 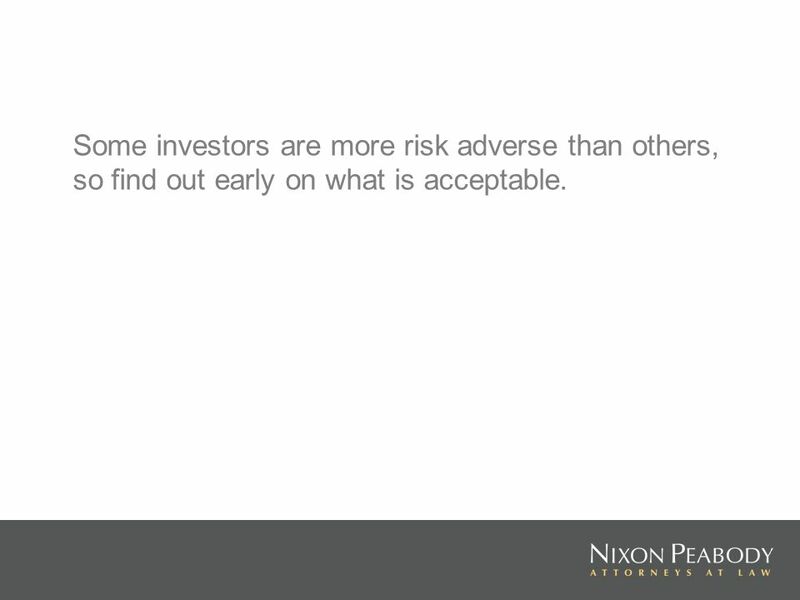 22 Some investors are more risk adverse than others, so find out early on what is acceptable. 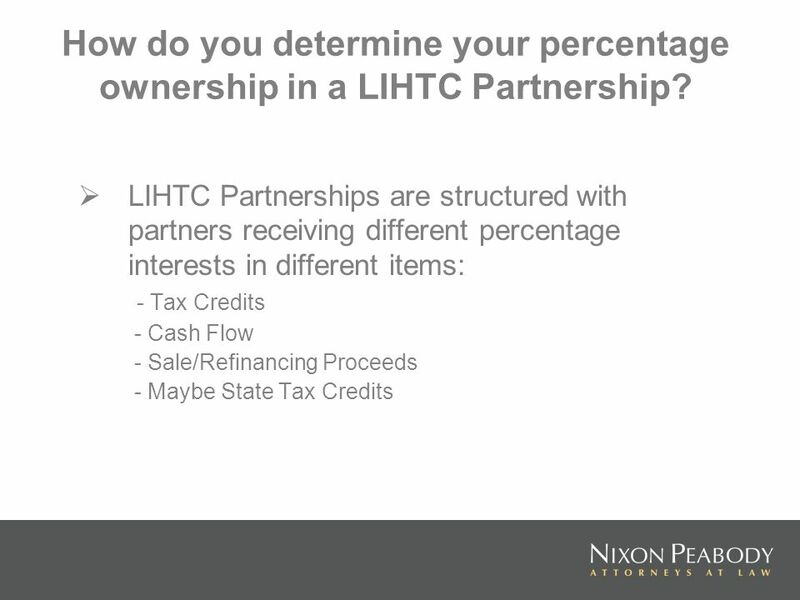 23 The Investor as a Related Party Also, dont forget the 10% test from the investor side. 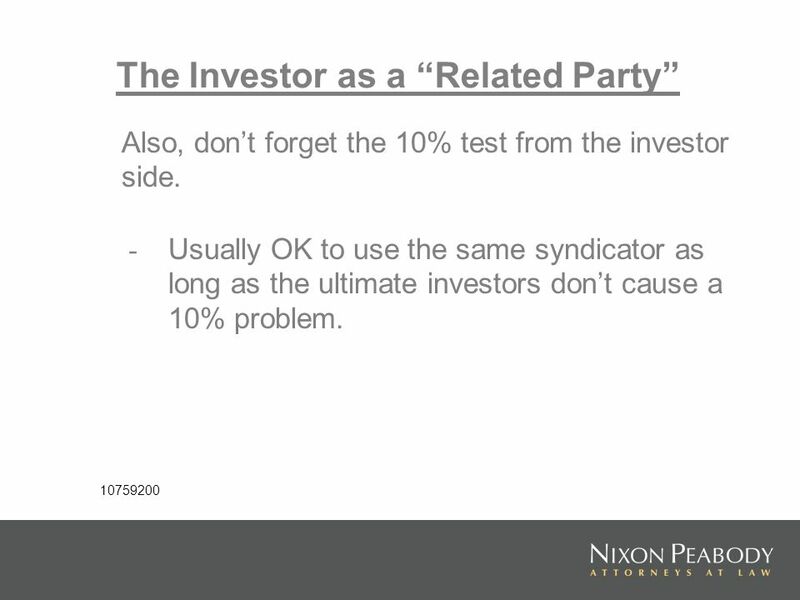 10759200 - Usually OK to use the same syndicator as long as the ultimate investors dont cause a 10% problem. 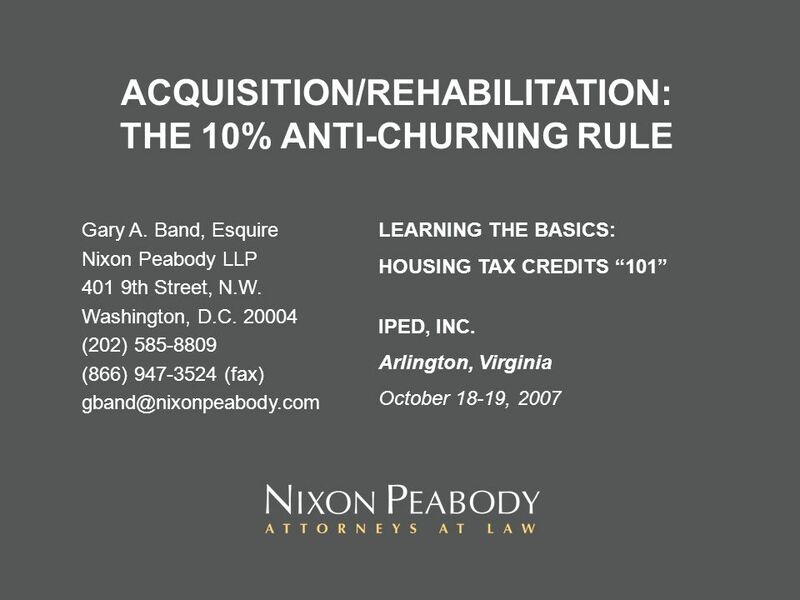 Download ppt "ACQUISITION/REHABILITATION: THE 10% ANTI-CHURNING RULE Gary A. 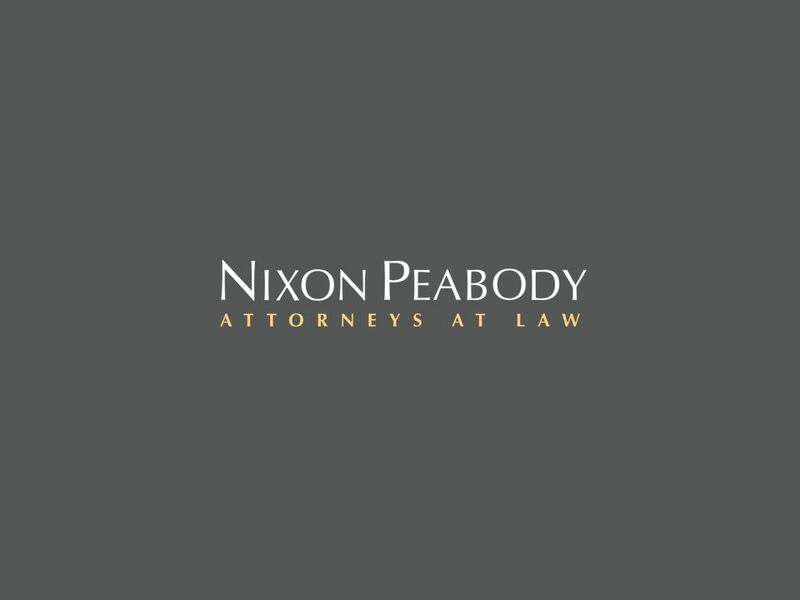 Band, Esquire Nixon Peabody LLP 401 9th Street, N.W. Washington, D.C. 20004 (202) 585-8809." Developing Imaginative Strategies for Higher Education Institutions to Capitalize on the New Markets Tax Credit Program June 28, 2007 Robert Fenning, Old. 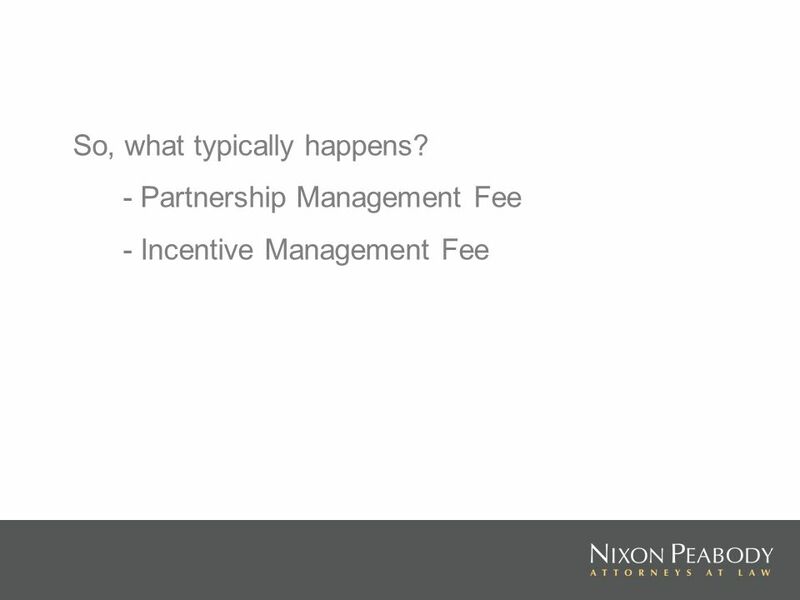 SOLAR TAX CREDITS James F. Duffy, Esquire Nixon Peabody LLP 100 Summer Street Boston, MA (617) LEARNING THE. The Basics of Solar Tax Credits Forrest Milder Herb Stevens © 2008. IPED Tax Credit Property Disposition 2008: Obligations and Opportunities Through Year 15 and Beyond Boston, Massachusetts, November 20-21, 2008 Forrest. 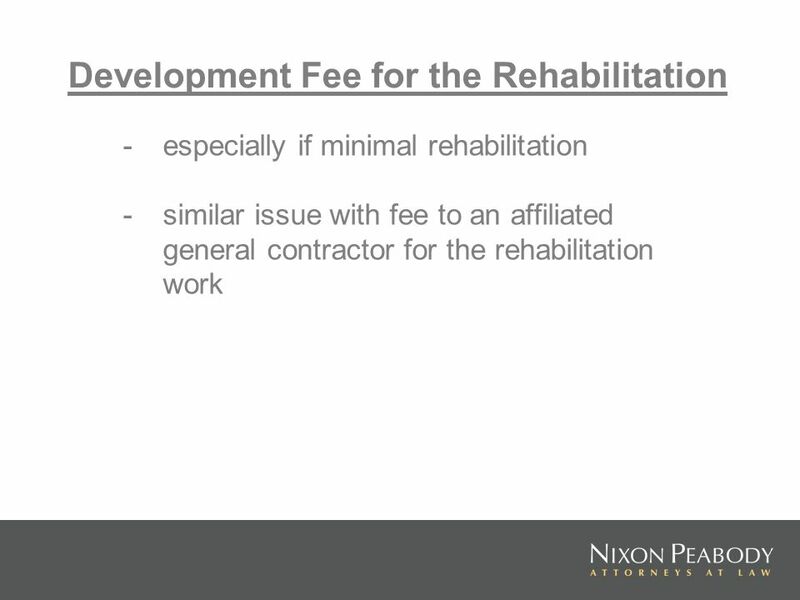 1 CRITICAL TAX ISSUES IN TODAYS HOUSING TAX CREDIT TRANSACTIONS: DEFERRED DEVELOPMENT FEES San Francisco, California July 24-25, 2008 Molly R. Bryson.